My heart hurts. No matter what pleasant thought I try to think, what flavor of candy I eat, what happy show I watch…I can’t get over it. Yesterday at Ollie’s check up, our doctor (with previous conversation and my guidance) kindly asked him what he thought of autism. His eyes welled with tears and his lower lip quivered. These words hurt my heart profoundly. Watching these words come out of my child’s mouth was something that I wasn’t prepared for. And I thought I was prepared for everything. I just love this little boy so much. I know the place of sweetness, sincerity, and virtue from which these words emerge. When Ollie speaks, those around him listen. I love being privy to his world. He has given so much pause to so many people whose lives he has touched. He shares his wonder for the world abundantly with every single being that he encounters. It’s so beautiful to be a part of Ollie’s world. Yet, sometimes seeing the world through his lens can be excruciatingly painful. As his mom, I wish that I could cushion the blows. He feels things so purely and intensely. For better and for worse. He increases our awareness of the wonder and curiosity of the world. He makes us laugh from the very bottom of our souls. He is truly hysterical. Yet, at times like this, I just can’t help but wonder what he’s enduring. I’m so grateful that he can share with us even a smidgen of the way that he experiences the world. I wish that I understood how to make him feel like he’s in the middle of a room where he’s supposed to be. What can I do to make that room the right temperature, the right atmosphere, the right mix of everything so that he would feel welcome just being himself? As sad as I am at this moment, I will get over this. What an incredible breakthrough to understand him! What a wonderful insight to where he is! I’m the luckiest mom in the whole wide world. …that I’m ready for harmony, grace, and sharing good times with our family. It’s terrifying. I’m not sure why. But it is. I’ve been thinking about why that is. The last 2 1/2 years since the accident were unbelievably difficult. But, the 3 years prior to that we had been trying to wrap our heads and hearts around figuring out what was going on with our son, O. He screamed all the time. Spaced out. Screamed more. Displayed very erratic behavior. Finally, the year before J’s accident, we got the autism diagnosis. I’m ready to look to the day in the future that I can say, ‘yep, those were some tough days, but, look at how strong we all are for having made it through them together’. This photo speaks volumes. 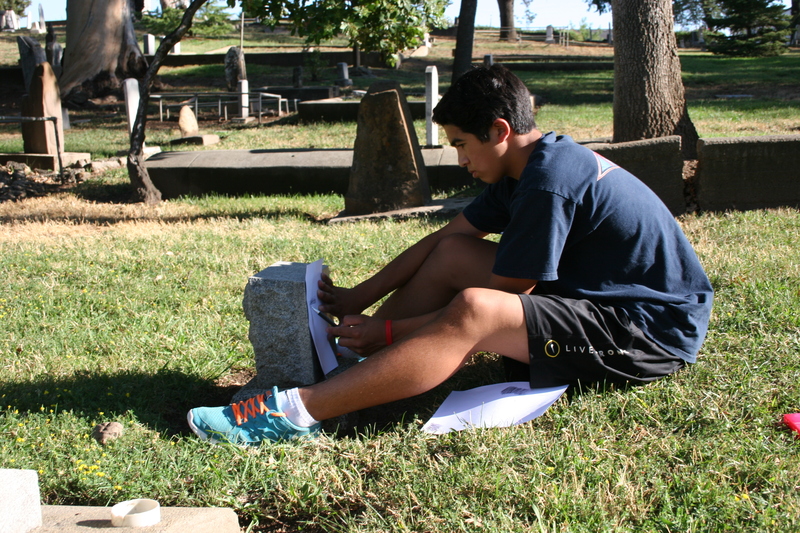 In simple terms it speaks of a boy who is etching the letters from a gravesite. Little does the casual observer know the incredible story behind this photo. The boy who is doing the etching was granted another chance at life. The woman of whose headstone is being engraved did not get such a chance. It was 1918, Masue Kaizuka had newly immigrated to the United States with her husband, leaving her son, aged 3 at home in Kada, Wakayama, Japan to be raised by his grandmother until they could make enough money to send for him. Sadly, that dream was cut short as after caring for the children of her community members who fell ill from the influenza virus, mostly from Wakayama, she contracted the disease and died on November 8th, 1918. Her son, Masao, came to The United States on a barge by himself at age 11, 6 years after his mother was put to rest in this Japanese cemetery in Vacaville, CA. He fended for himself and made a life. A beautiful life. He had a beautiful wife and 3 sons. The boy in the photo is the grandson of his eldest son. Nearly two years ago, this handsome boy survived a tragic accident in which he incurred a traumatic brain injury. If it weren’t for the fact that he was born now, lived in The United States, near an incredible trauma center and was the recipient of the very best of the best that neurosurgery had to offer in 2010, he would not be here, etching the letters of his great great grandmother’s headstone and honoring her. Funny how life is. If it was she that was born now, most likely she would have survived. And if it were he that had incurred his injury in 1918, he would have not survived. As the mom of this darling and courageous boy, I’m grateful for the life that my great grandmother sacrificed for us. We are forever grateful for you. I’m also so grateful that my son was given another chance to live. Yes, beauty is certainly in the eye of the beholder. Today, I smile at the beauty that lies before me in this photo. Such sadness, sorrow, grief, and true beauty. Yet I can’t help but to feel so blessed. Yep. The pain is still there. It hasn’t subsided at all. I don’t know why I think that it would have dulled in this year and a half. You get over confident. As soon as you think for a second that it’s okay. It’s okay to breathe in, and breathe out without worrying. Without having to hold your breath on the inhale, or the exhale. It’s always there. Always. Breaths are labored. There is either a subtle hold on the inhale, between breaths, or on the exhale. This is how I exhibit pain. No matter how hard I try to hide it. This is how I recognize pain in others. It’s so obvious. It’s so painful. I didn’t choose this path to be able to feel this, or to recognize this, but it is just what it is. It is there. It is glaring and blatant…and unfathomable. Yet, it is here and now. My heart bleeds for those of whom hold their breath on the exhale. I know them. I am them. Or the inhale. It’s so painful. I know you. I want to reach out to you. But, I don’t. I just try and exist and pull it together. I do stop in my tracks, pray for you, pray for me, and hope that we are both somehow pushing forward in this struggle. Against what? Against the pain. The loss. Today it hit me when I didn’t expect it. I was cleaning the garage. The plastic container of cleats was over flowing. There were two pairs that needed to be added to the box…last year’s football and baseball cleats. I put them in the container. My hands were shaking. Maybe one of the younger boys will use them. Maybe not . I hope not. Yet, I still hold onto them. I cannot let go. Today I opened my email and nearly jumped out of my seat. My O was invited on a playdate!!! Holy Heavens, it is a big thing for us. Of course, I broke into tears. 3 year ago, I never, ever saw the day in which I saw a day in which my child was capable of playing, further more, being invited by a peer on a playmate. It makes me think. A lot. I always divide things into two piles…the things that I can control, and the things that I cannot. Today threw the equation off a bit. I do not like to give blatant control of my children’s lives to any person. But, in some respects, it was another person’s action that I had no control over that dictated my child’s life. My life. I’ll have to ponder that a bit more. What I do know is that my child’s eyes lit up when I told him he was invited on a play date. He was truly elated. I love to see his eye lit up. But his reaction is not that of a child that craves personal connections. It was a reaction of a child that loves star wars and knew that this buddy also loves star wars. That is sweet. Posted by caizooka in writings. There are times in your life when you are forced to stop. And listen. One of these moments happened last November when my oldest son, Julian, incurred a traumatic brain injury. When the doctor told me, ‘your son has a bleed in his brain’, the world stopped spinning. I fell to my knees. Oxygen stopped flowing through my body. No air in. No air out. The memories of what ensued after, with his loss of consciousness, the discovery of how fast the bleed was, the emergency surgery, the Pediatric ICU, the brain swelling, watching my extremely vibrant son fade in front of my very eyes…it’s all a blur. ‘I have faith’. These three words exhibit the human experience on such a fundamental level. Are you born with faith? What is it? Are you taught it? Is it something that happens to you at some point along the way? How do you know it has happened? I’ve felt spirituality at various times in my life, in different ways. I vividly remember the intoxicating smell of incense at Catholic masses growing up. I have felt benevolence towards my ancestors when dancing in Bon Odori festivals. I have been moved to tears by many a Buddhist or Shinto ceremony in Japan. I have felt connected to God, listening to the prayers echoing throughout the streets in Cairo, on loudspeakers from mosques everywhere. I have felt reverence at a Native American pow-wow prayer. And, I have experienced a beautiful moment of hope at the ceremony and celebration of a Jewish bris. There is something spectacular about bearing witness to people when they are expressing their faith. In whatever culture they might belong to. There is a humbling beauty in the pride of individuals performing the same rituals as their ancestors. I used to think that I had faith because I believed in God. I was baptized, completed most of the sacraments in the right manner. I have always loved church and have enjoyed the serenity it brings me. I bask in the intellectual aspect of the scripture and am thoroughly moved by the interpretations of others. It is fascinating. I like to ponder what it means and how someone else could have reached a different conclusion than me about a passage. I like to think about the path that God must have led that person on, to incur such different beliefs. I like to challenge ideas and be a little nonconformist, but I have still always believed. In the hospital with Julian, when I could not breathe, it was as if God was standing in my very presence holding my hand, blowing air in and out of my body for me. I never questioned His presence. I had faith that He would bring us through this. And He did. Two years ago, after walking arduously through a definitively unpaved path, my middle son, Oliver, was diagnosed with autism. In some respects, it was an incredible relief to have terminology attached to the behaviors that we continue to endure. However, it also took me through a combative cycle of grief, acceptance and love. Bearing the burden of raising a child with autism is often times more than a human can endure. Social isolation. Confusion. Regression. Yet, because of the lack of social barriers, the love that pours out of my son’s heart is completely unfiltered. I soak it up and savor it with all of my heart. The one why that I am now certain of is, ‘Why me?’ This one has become abruptly apparent in the past few years. He chose me beyond all other moms in this world to care for these children. It empowers me to know that God has faith in me to guide these three darling, yet very challenging boys. He has carefully navigated me through life, to learn the lessons, gain the strengths, and overcome my own insecurities, all for the very important purpose of being able to best support and provide for them. With all of the tragedies that have occurred to me or around me, it’s becoming more and more apparent that faith is at the heart of it all. That voice is easier to hear, the more I listen. Faith is about knowing that we are powerless. Knowing when to exert power and fight, and when not to. There is blind faith and there is conscious faith. There are times when both are necessary. Faith for me is also having the space and awareness to listen. Listen to the guidance of the Holy Spirit. Divinity is always present. When you tap into it and can hear it clearly, it is beautiful, poetic and strong. There are times in life though, when no matter how quiet it is in the room, your mind and your heart are so congested that they can’t filter out the noise. Those are the times that blind faith predominantly guides me. Those moments are entirely driven by my confidence in my ability to step back and put everything in God’s hands and be willing to accept and embrace whatever God gives me. There are rough moments in life. We all have them. We all approach them differently at different times in our lives. Combating the many unknowns of what autism has in store for Oliver and for our family is a large pill to swallow at times. But, I am not scared. I know that He will guide us and that my faith in Him will prevail through autism, as it has through divorce, through ethnic identity, through a ravishing eating disorder, through a traumatic brain injury. Whatever it may be, I have faith.